If you’re like us, you probably have a go-to white tee and denim that you wear at least once or twice a week. Well, the same goes for accessories too. From a sleek crossbody to a minimalistic scarf, here are four fashion accessories our editors can’t live without. 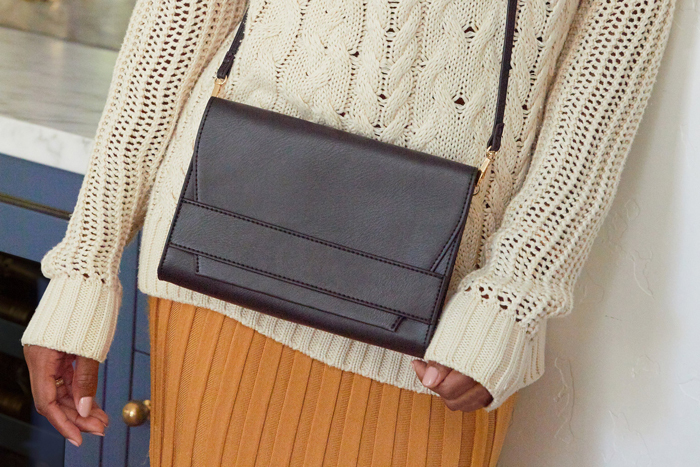 Work to happy hour to Sunday brunch — no wardrobe is complete without a functional crossbody bag. It keeps your essentials close without distracting from the rest of your outfit. Our favorite? The Summer & Rose Celine Crossbody because it has a pop of metallic flair to take you from day to night in a flash. There’s no going wrong with a neutral scarf. Wear it in the fall with a midi dress and boots or drape it over your shoulders come summer! Our editors are obsessed with the DONNI Tri-Color Scarf because the color-blocked pattern and 100 percent acrylic material provide both comfort and style. Like a crossbody, every gal needs a cute clutch in her closet. It can instantly pull your look together, especially when it’s in a flirty shade like the Aimee Kestenberg Marietta Flat Wallet. The blush pink hue is subtle enough to pair with any ensemble. Plus, it’s super functional with six card slots, an oversized slip pocket, and a secure zipper closure. Whether you go for a fedora, Panama cap, or beret, adding a trendy hat or hair accessory to your outfit can instantly add sophistication and style to your ‘fit. How do I get an Editors box? I tried to buy the Editors box about 2 1/2 to 3 weeks ago and it was sold out. it's unusual for a box to sell out so quickly. I was really looking forward to getting the purse and wallet in my box. Will there be another chance to purchase these same items? And if so, will it be in the near future? I was really bummed to miss out on these items. How do I get the editors box? Am I missing something? I am an annual subscriber. Please let me know what I need to do to get an editors box.